Churches Together in Swinton and Pendlebury exists to promote Christian unity and understanding between members of different denominations. Advent Prayer Station on Swinton precinct every Saturday in Advent. Prayer requests are used as a focus for prayer in the following day's service. Easter Day 7.00 celebration of the Resurrection on the Town Hall steps. A range of activities have been tried from time to time and may well be tried again - with various degrees of success. Thus we have had combined Sunday School meetings, Combined Youth Activities - eg a drumming evening, support for local election hustings, support for the community activities of the Salvation Army, a Unity Cross, created in the service for church unity which then spent time in each of our churches. 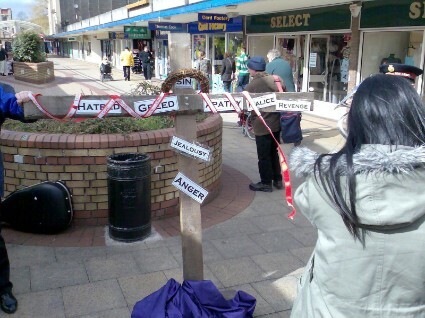 The Good Friday Cross on Swinton Precinct after CTSP Walk and Service of Witness.